Remember when Floyd Mayweather was dragged through the mud—repeatedly—for talking publicly about the business behind matchmaking? The “purists” and serial critics deemed Mayweather’s business talk unbecoming of a “real” fighter. He was accused of ducking everyone and anyone within his weight range—even fighters he would eventually face. But, while Mayweather’s public stance on the business side of boxing was offensive to some sensibilities, he wasn’t lying. What Mayweather discussed openly is what every promoter/matchmaker/manager labors over behind the scenes. Risk vs. reward is an issue for every fighter—not just now, but ever since fighting became a money-making venture. The question always asked is whether the risk of a fight is worth the possible reward gained from winning the fight. And, as a fighter’s fame and bankability grows, that risk increases while the reward brought from outside conquests often diminishes. So, it only stands to reason that those fighters with the most to lose will work to either diminish as much risk as permissible by the buying public and/or insist that the “B-side” bring more to the table in terms of drawing power. But try to explain this to fight fans caught up in macho fairytales or to fanboys with agendas to push or axes to grind. In this day and age where everyone has a “side” and a voice via social media, this risk vs. reward dynamic is wielded like a weapon. If a fan-favored fighter is “avoided,” then the fighter avoiding him is a ducking coward, running scared from his sure comeuppance. However, if that same fan-favored fighter is actually doing the “avoiding,” it’s argued that the other guy simply isn’t worthy of a shot, he’s not big enough or deserving enough. 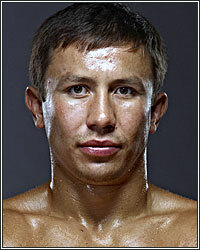 This blatant double standard couldn’t be more clearly evident than in the case of Gennady Golovkin. The WBC’s recent ordering of a Golovkin-Jermall Charlo final eliminator for a shot at Saul Alvarez’s newly-re-acquired middleweight belt has brought back the laments from fiercely protective Golovkinites. The argument is that Charlo’s body of work and overall resume shouldn’t qualify him for a shot at a top-two star in the division yet, especially with a doable GGG-Canelo Part 3 still out there. Golovkin trainer Abel Sanchez helped stoked the fires to singe GGG-Charlo talk. “[He earned the shot] by fighting who? What does that mean that he’s a mandatory? That he deserves a shot? He’s got to earn his shot…These guys all of a sudden think that they deserve a shot at the winner of Golovkin and Canelo—they’re crazy. They’ve got to earn it. Of course, this is the same Sanchez who railed against Sergio Martinez, Miguel Cotto, and Canelo Alvarez when they passed on his fighter, who, at the time, brought great risk for relatively minimal reward. The same fans who supported Team Golovkin in their quest for (as Sanchez called it) a “hand-out” against much bigger names, are now insisting that Charlo must prove himself further before getting a Golovkin fight. The truth is that Sanchez, like Mayweather, is right. Business dictates matchmaking realities, especially at the highest levels of the sport. Everyone with a real working knowledge of the business of boxing understands this. But this basic truth applies to EVERYONE. Those picking and choosing when to apply this reality, depending on who they like or don’t like as fans, are just suckers for promotional spin—and they’re part of the reason spin beats logic in boxing discourse these days.